The 2016 election will go down in Iowa history as a time when a record number of women sought office. It won’t, however, be remembered as one where women saw gains. While women nationally continue to absorb the loss of the presidency, Iowa women have added concerns. None of the Iowa women seeking federal office were elected — Patty Judge, Kim Weaver and Monica Vernon, all Democrats. A massive influx of Republicans to the Iowa Statehouse also took its toll on prospects for gender equity in Des Moines. Eleven women sought election to nine seats in the Iowa Senate. One woman — Democrat incumbent Janet Petersen (District 18) — ran unopposed. In Senate districts 14 and 34, female incumbents faced female challengers. When the night was complete, women held three of those seats, with only one woman — Democrat incumbent Pam Jochum (District 50) — receiving more votes than a male challenger. 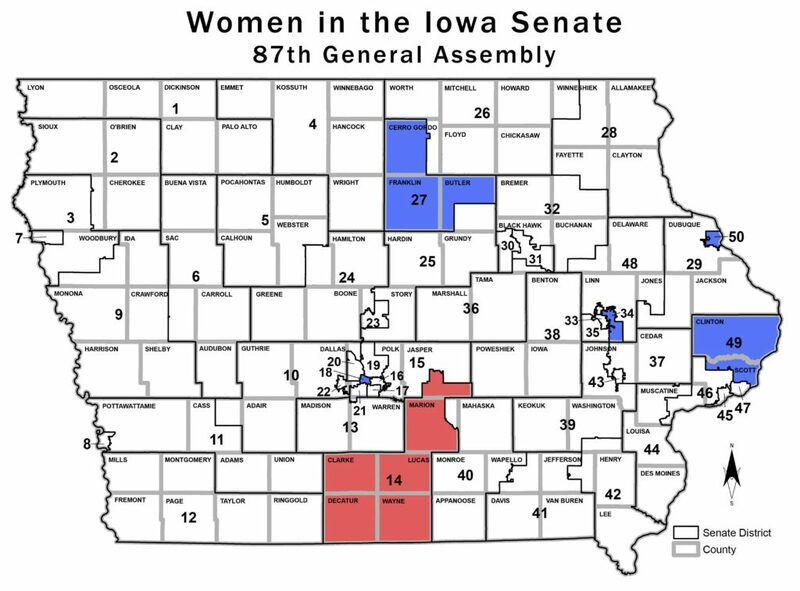 Only six women will serve in the Iowa Senate when it convenes in January, a loss of one. Amy Sinclair (District 14) remains as the lone Republican female. This means half the state’s population is represented by 12 percent of Senate members. Of the 100 Iowa House seats on the 2016 ballot, 51 women competed in 45 districts. In 11 districts, female incumbents (two Republicans and nine Democrats) ran unopposed. Of the remaining 34 contested races, women held 17, keeping their number the same for the upcoming session. When the legislature convenes in January, women will control 18 Democratic seats and nine Republican seats, or 27 percent of the Iowa House. Looking at the entire General Assembly, women hold roughly 22 percent of 150 seats. That’s a little less than the current legislature, and not the gains bipartisan advocacy group 50/50 in 2020 hoped for. What happened? Maggie Tinsman, former Republican Senator representing Bettendorf and 50/50 co-founder, says part of the problem is that not enough GOP women are seeking office. Tinsman is correct. 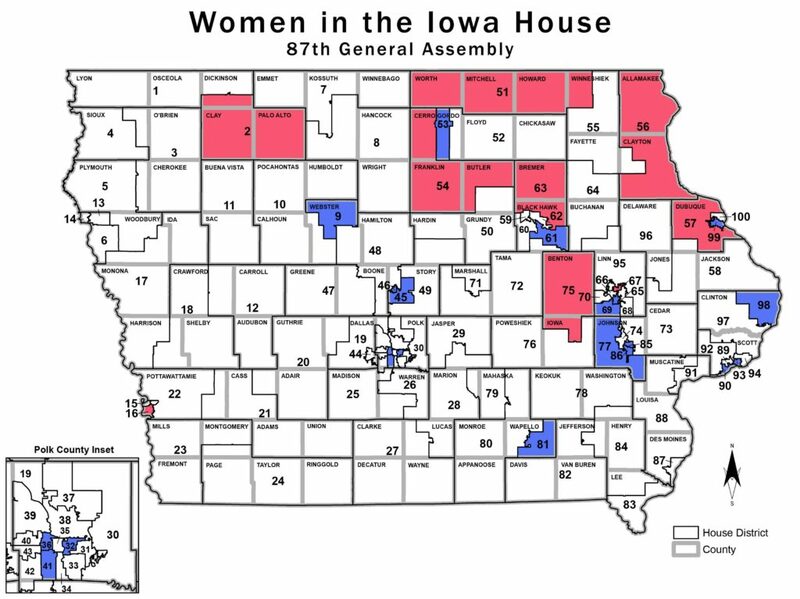 Of the 62 women seeking election to the Iowa Statehouse this year, only 15, or less than a quarter, were Republicans. Third party and independent candidates aren’t faring any better. This year, only two women were among the 26 candidates on the ballot that did not identify as part of the two dominant political parties. 50/50 in 2020 has known since its inception that achieving gender equity in Des Moines in time for the 100th anniversary of women’s suffrage was an uphill climb. The disappointing results of 2016, the group indicated, “will serve only to strengthen our resolve to attain gender equity.” But with only two elections remaining and a shifting Iowa electorate, it’s difficult to see a clear path to 50 percent. Nonetheless 50/50 co-founder Jean Lloyd-Jones, a former Democratic State Senator from Iowa City, is pledging to continue to train and support female candidates. “We are extremely proud of all the women who stepped forward to campaign in 2016. We know that each one invested tremendous amounts of time, energy and passion in their quest for public office,” Lloyd-Jones said. Those who hope for equity will need to intensify their efforts in the coming years. Specifically, and as my analysis of the 2016 candidates in a previous column noted, women in rural portions of the state need to be encouraged and trained on how to seek office.